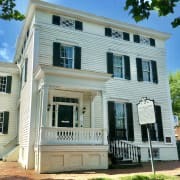 The Lee-Fendall House Museum is looking for volunteers to lead guided tours for the public at this historic house museum, located in Old Town Alexandria, Virginia. Leading guided tours of the house museum. Developing knowledge of the museum and its collection in order to engage visitors in dialogue and answer questions. Ensuring the safety and security of the museum and its collections during tours and programs. Collecting and recording admissions and gift shop sales. Attending training as scheduled by the museum staff, including regular volunteer meetings. Provide light house-keeping duties as needed: sweeping, dusting, etc. Distribute museum brochures, posters, or other marketing materials to clubs, groups, and other networking avenues. Enjoy working with the public in a museum setting. Knowledge of American and/or Virginia history is preferred, but not required. Volunteers will be expected to work a minimum of 6 hours a month, which may consist of a combination of half day shifts (3 hours) or full day shifts (4-6 hours). Regular commitment is desired and volunteers are encouraged to provide more than the requested minimum hours. Three days of training must be completed within the first month of volunteering. Training and guidance will be provided by museum staff. A docent handbook which includes a history of the site and other operational materials is provided on the first day of training.